The Battle of Jersey was technically the last battle fought in the British Islands (coming after the Battle of Culloden in 1745). It was the last attempt by France to invade Jersey militarily. Since Jersey was used as a base for privateering by the British against American shipping in the ongoing American War of Independence, France, engaged in the war as an ally of the United States, sent an expedition to gain control of the island. The expedition ultimately failed, and its commander, Baron Phillipe de Rullecourt, died of wounds sustained in the fighting. An amazing discovery was made in the course of the restoration programme of the paintings belonging to the parish of St Helier. A copy of the painting of one of the most significant events in Jersey's history was found to be very much more important, and therefore more valuable, than was first thought. 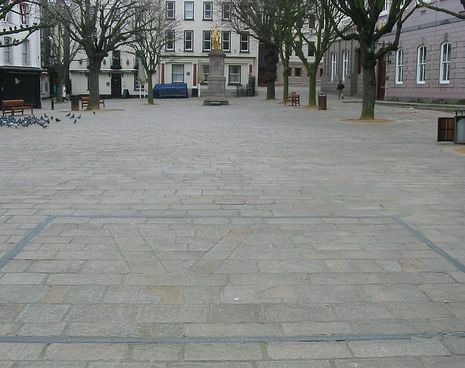 On 7th January 1781, a contingent of French soldiers invaded Jersey and were defeated in a brief but bloody battle in the Royal Square (or Le Vier Marchi as it was then known) outside the Royal Court. The commander of the British forces, Major Peirson was killed in battle, but the French were defeated. The battle was reported in the London Gazette, where it was read by an Alderman of the City of London, called John Boydell. John Boydell was a pushy, successful engraver, whose business was at 90 Cheapside in London. He knew and admired a fashionable American artist John Singleton Copley, who had settled in London and made a considerable reputation for himself painting historic subjects on a grand scale. 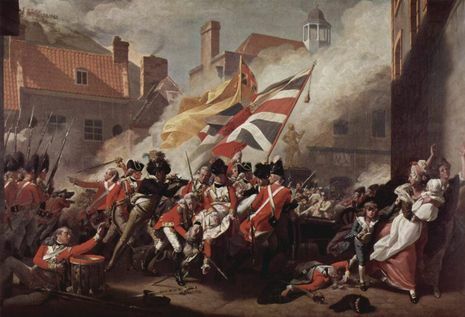 Boydell's imagination had been captured by the report of the Battle of Jersey and he influenced Copley to paint it.